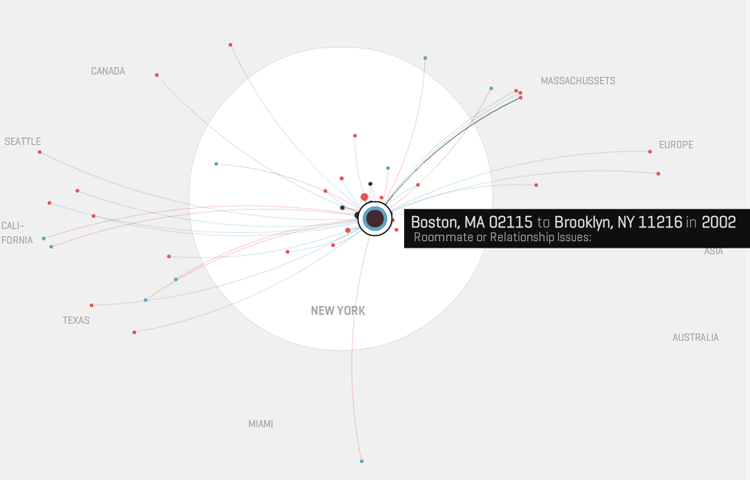 Infographic of the Day: Why Do People Flee and Flock to New York? California? Jersey? The moon? Hell? So where do New Yorkers go when they’ve tired of the rats, the rotten-vegetable smell, the $3,000 a month apartment, trying to catch a cab in the rain, the 1 train, the lines, the pasty tourists walking slowly in front of them, the pasty tourists stopping in front of them, the pasty tourists doing a cheer pyramid in front of them, Naked Cowboy (a pasty-tourist favorite)? Somewhere else in the New York area, of course! So says a new interactive infographic from data visualization designer Moritz Stefaner (who hails from Germany of all places). The infographic maps more than 4,000 moves both in and out of New York from over 1,700 people in the past decade based on an informal survey by New York public radio’s the Brian Lehrer Show. Stefaner was one of several designers to visualize the data in a BLS-sponsored design challenge, and though the results don’t surprise — when New Yorkers get priced out of Manhattan, they head for Jersey — they do paint a lovely (if unscientific) picture of a city constantly in flux. Obviously, the info should be taken with a grain of salt, since it’s less a survey of New Yorkers than of people who listen to the Brian Lehrer Show. Still, it’s neat way to visualize complex migration patterns — with the added thrill of eavesdropping on real human stories. For more FastCompany.com coverage of Stefaner’s work visualizing twitter, go here. And for more of the Brian Lehrer Show‘s “Mapping your Moves” infographics, go here.